Mary & Phil Hold The Key To Your New Home! 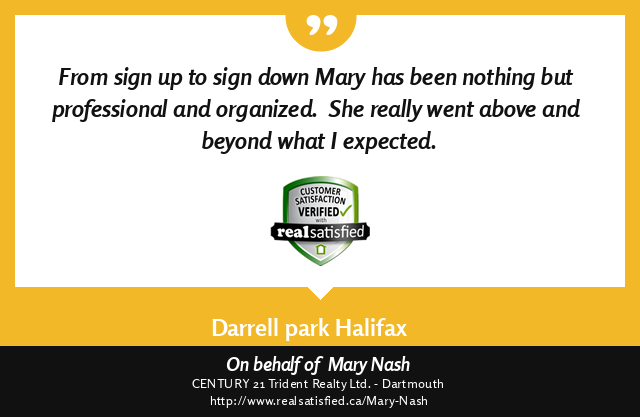 Mary and her husband Phil were recommended by Jim Datlen at the Century 21 office in Brampton, Ontario. My family and I decided to relocate to Nova Scotia. From the first meeting with them, I knew we were going to get along together. Both Mary and Phil were excellent to work with, and I will definitely recommend them and would use their services again if I ever decide to sell my new home. Thank you for making this huge move as smooth and painless as possible. Mary was extremely helpful with the whole home buying process. As a first time buyer we had many questions that Mary was always able to answer. Mary was always available by phone, email, or text message. I very highly recommend using Mary. We were very happy and more than satisfied with Mary and Phil's Professionalism as well as their understanding of our needs. They were very quick getting back to us with anything we needed or concerns we had. We felt both of them went above and beyond for us. Mary and Phil found us the perfect home and we couldn't be happier. We would definitely recommend them to family and friends. Mary helped me hunt for my first home. It was not an easy hunt but she stuck with me and together we found the perfect spot! Her knowledge of the area and her sound advice are invaluable. Could not be happier with my new home and all of the effort Mary put in to help get me there! 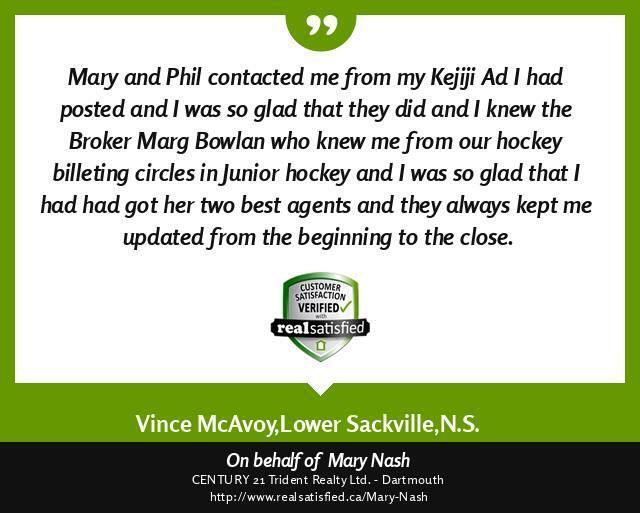 Mary and Phil contacted me from my Kijiji ad I had posted and I was so glad they did and I knew the broker Marg Bowlan who knew me from our hockey billeting circles in Junior hockey and I was so glad that I had got her two best agents and they always kept me updated from the beginning to close. This was our second property that we listed with MAry and we were so impressed with the results of the first listing, there was no way we were going to move to another agent. When you find someone with Mary's expertise, professionalism, friendliness, and dedication to her clients, those attributes will sell your home. Mary always had our best interests at the forefront when dealing with perspective buyers. No matter what time of the day or night Mary communicated with us to ensure we were appraised of the progress of a potential sale. The use of technology in marketing the property through the Internet and the use of Virtual Tours works very well in today's marketplace. MAry Nash and Phil Shannon do that very well. 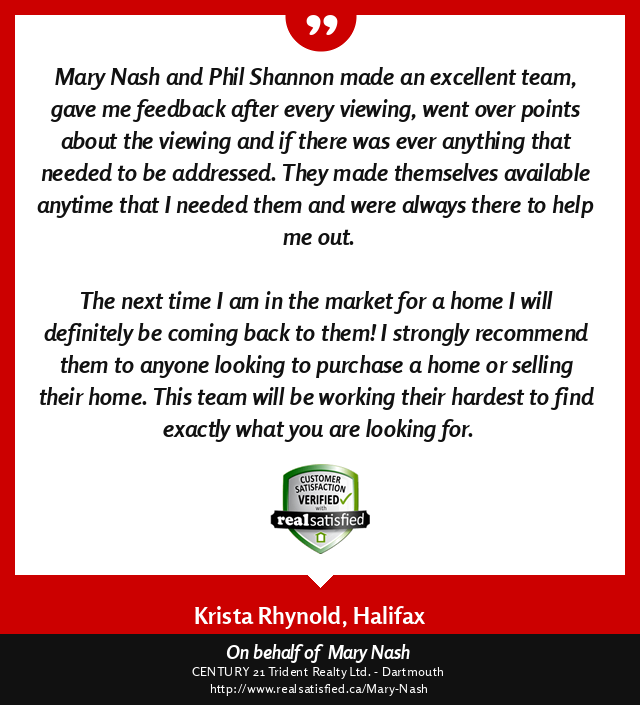 We would not hesitate in recommending Mary Nash and Phil Shannon to our family and friends if we ever have another property to market we would definitely use. Thank you for selling our home Mary & Phil! 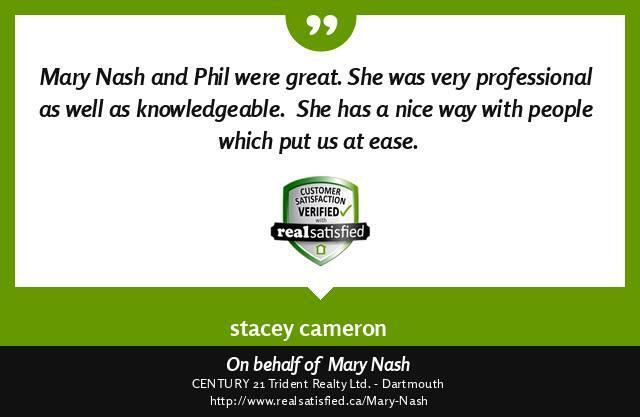 I would recommend Mary and Phil, for both buying and selling. They are great to work with. We bought our house through Mary and Phil this year. At 8pm on a Saturday night I messaged Mary and within minutes she called me back to arrange a time to view a proprty the following morning. Once we viewed the house we informed Mary and Phil that there were a few more houses that we were interested in seeing before we made our decision. Mary and Phil immediately cleared their schedule for the day, and spent the next 6 hours showing us the properties. One of which we ended up purchasing. From showing the properties to negotiating and providing top notch references for brokers/lawyers/house inspectors, Mary and Phil went above and beyond and made everything as easy as could be. I would highly recommend. I recently sold my property. My realtor was Mary Nash. Upon our first meeting it was evident she loves what she does, she was so enthusiastic. Immediately her professionalism, knowledge ,and friendliness a winning combination, impressed me. I had no hesitation listing with her and was so glad I did. Mary was helpful every step of the way. Always accessible to answer any of my questions big or small. There was always open communication. Her work ethic cannot be matched. She worked tirelessly for me with advertising, realtor walk throughout , open house, and many viewings. She is an amazing person professionally and seems more like you are dealing with an old friend ...a winning combination in my opinion. I would highly recommend Mary without any hesitation to anyone buying or selling a property. I believe you would be well served to say the least. In 2010 I met my future husband and he moved into my home. He had been renovating an older mobile in Lake Echo and we spent months trying to sell it ourselves getting more and more frustrated with empty Open House Days and tire-kickers. We listed on Kijiji and Mary contacted us asking if we had any questions (which we did) but didn’t pressure us to list with her – she was just concerned that we may be going down a road with no guide. When we finally got fed up, we called Mary to list our property. She did more than just put up a sign on our lawn and put it on the MLS; she contacted other agents, put up flyers in apartment buildings and had an “Agent Open House” bringing 17 other agents thru our mobile in one afternoon. When the right buyer came along, Mary dealt with everything. She ended up selling our mobile for a much better price than anyone else said we should have gotten and she made us feel comfortable that she was on our side and had our backs. In 2011 when we decided that my house was too small for the two of us there was no question who we’d have to list our home. It was again an older home (60 Yrs) but we had done upgrades to make it more like a new home. With Mary’s marketing and working well with the buyer’s agent it was SOLD in 13 Days! We couldn’t believe it. We had already committed to buy our next home so it was such a relief to have it sold so quickly. In 2014 we decided to purchase a cottage down the Eastern Shore. Again, I got on the phone to Mary. She was up for the challenge of finding the perfect property for us. She patiently booked viewings and spent a couple of days touring the Eastern Shore with us. I kept asking her “are you sure you don’t mind going to look at more?” She assured us that we’d look at every listing until we found the one that was right for us. We ended up with a property that was more than we ever expected. We had been looking for a cottage but ended up with our future retirement home. I constantly recommend Mary to anyone who mentions that they’re buying or selling and I don’t normally recommend anyone for anything. She is one of the most Down to Earth people I have ever met and her honesty is refreshing. She has a great work ethic and her commitment to her clients shows. I originally attempted to sell my home originally by myself without much luck. I had a less than pleasant experience previously with a real estate agent and was a bit leery to engage the help of another realtor. I sat down with Mary and I immediately knew she was genuine and her no pressure approach was unique. My home sold almost immediately with her aid. She took the time to properly advertise( virtual tour, open houses and reaching out to other realtors). She is not concerned solely with monetary gain, as unfortunately, some agents are. She knows how trying the entire process can be and was there for me every step of the way. I'm in the process of purchasing a new home and without hesitation, have enlisted Mary as my real estate agent. If I can sum it up....you will thank yourself that you found and enlisted her help. She is a professional with experience, personality and genuine concern. The real estate profession needs more people like her!